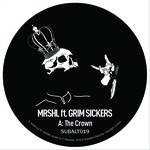 The latest Subaltern release comes from new signee and rising talent MRSHL. Hailing from the San Francisco Bay Area, California, this powerful grime-influenced debut also brings British grime star Grim Sickers along for the ride. "The Crown" lines up to be nothing but a true anthem. Rough and tough bass-lines complement a barrage of razor-sharp bars, which Grim Sickers delivers in true UK style. "Death Dealer" fuses MRSHL's grime influences with a meditative sound system vibe. "Endless Mirrors (Harp Riddim)" presents an intelligent and carefully constructed melodic piece. Bouncy kicks complement light harp lines and piano riffs.